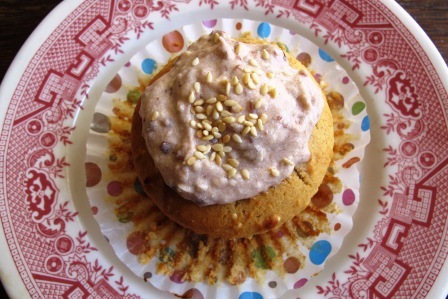 This month’s Recipe Redux theme was the cupcake conundrum – still a trend or over it? Quite frankly, I think the trendiness of cupcakes is waning and another dessert will be all the rage soon. Nevertheless, I decided to refresh the cupcake by adding an Asian twist, something trend reports say we will be seeing more of, Asian-inspired desserts. One of my favorite Asian desserts when we are having dim sum are the sesame balls. They are a hollow dough filled with red bean paste, lightly fried and rolled in sesame seeds. Certainly not the healthiest option, but something I only eat on occasion. 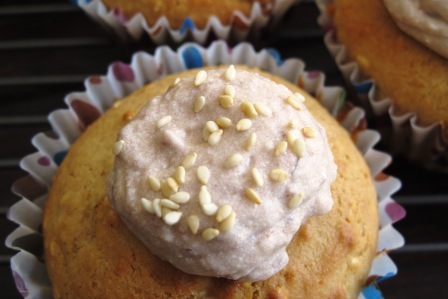 So it felt only natural to take my love for red bean paste and sesame and turn it into a cupcake. Different, yes. Tasty, absolutely. 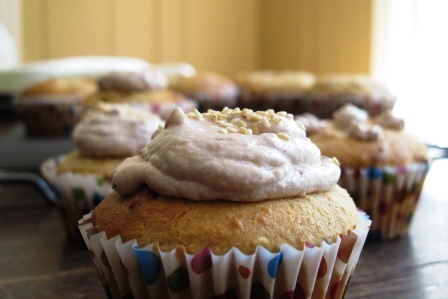 Tahini, which is essentially sesame seed paste, lends a subtle nuttiness to the lightly sweet cupcakes. 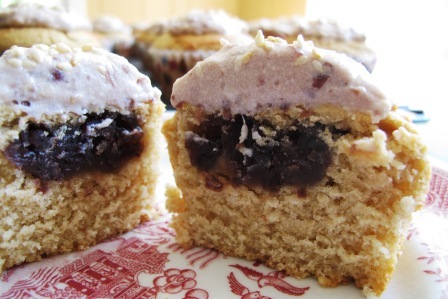 I found this recipe for Honey Sesame Cupcakes that would be a good foundation. I made a few modifications to the recipe, using white whole wheat flour which is my baking go-to for just about everything these days, instead of all-purpose. You really can’t tell a difference. Also, I dialed back on the amount of sugar and honey since the red bean paste adds a good bit of sweetness on its own. Then I created my own frosting recipe. You could make your own red bean paste from adzuki beans, or just purchase it already prepared from an Asian market (I was strapped for time so that is what I opted to do). My 15 month old loved the cupcakes. She couldn’t get enough. My 4 year old loved the cupcake part, but wasn’t a fan of the frosting, which is odd for him as it is usually the opposite way around. My husband also gave it his seal of approval after looking at them with some skepticism initially. As for me, I loved the balance of sweetness with the hint of sesame nuttiness. Enjoy! Cupcakes adapted from Curiously Ravenous. Preheat oven to 375 degrees F. Line a muffin pan with cupcake liners. In a large liquid measuring cup, put one tablespoon lemon juice then fill to the 1 cup mark with milk. Stir well and set aside for at least 5 minutes. Alternatively use 1 cup of buttermilk in place of the lemon juice and milk. In the bowl of an electric mixer, cream together the butter, sugar and honey until well combined, about 3 minutes. While the mixer is running, add the egg and beat well. Then add the tahini and beat well. Stir the vanilla into the milk and lemon juice mixture. Alternate adding the flour and milk mixture to the batter, ending with the flour. Incorporate well with each addition. Stir in the sesame seeds. Fill the cupcake liners about ⅓ of the way with the batter. Add 1-2 tsp of red bean paste to each. Top with the remaining batter. Bake for about 15 minutes or until golden brown. Allow to cool completely on a wire rack before icing. To make the frosting, beat together in the bowl of an electric mixer the red bean paste, butter and yogurt. Add in the sugar and tahini. Beat until well combined and smooth (though there will still be chunks of the red beans from the paste). 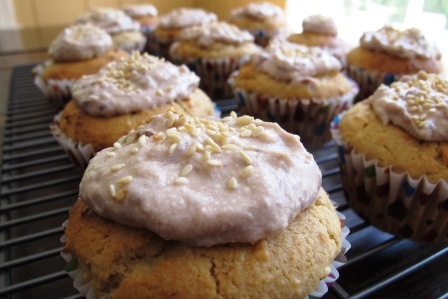 Ice the cupcakes and garnish with toasted sesame seeds if desired.